The Met Office has released data from 1300 weather stations around the world which show that the globe is getting warmer, reported the Guardian Datablog. 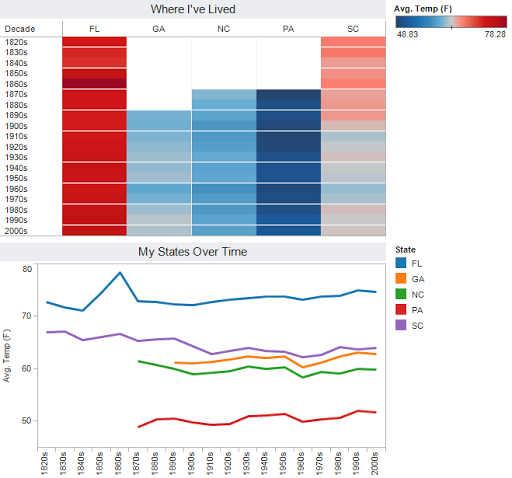 I also read a blog post recently from FlowingData describing a "Quick and Easy Solution" for creating a heatmap. Apparently an eight-step process, which requires programming skills, is "quick and easy." If you want a real quick and easy solution, use Tableau. The functionality is already built into the software...no programming required. Back to the story. 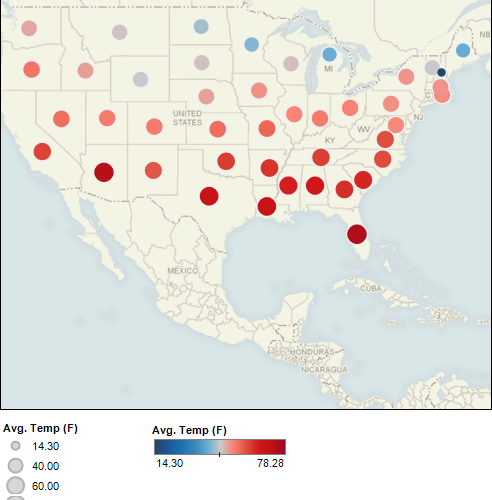 I downloaded the US temperature data from the Guardian Datablog and had to reformat it a bit and I came up with the following visualizations. 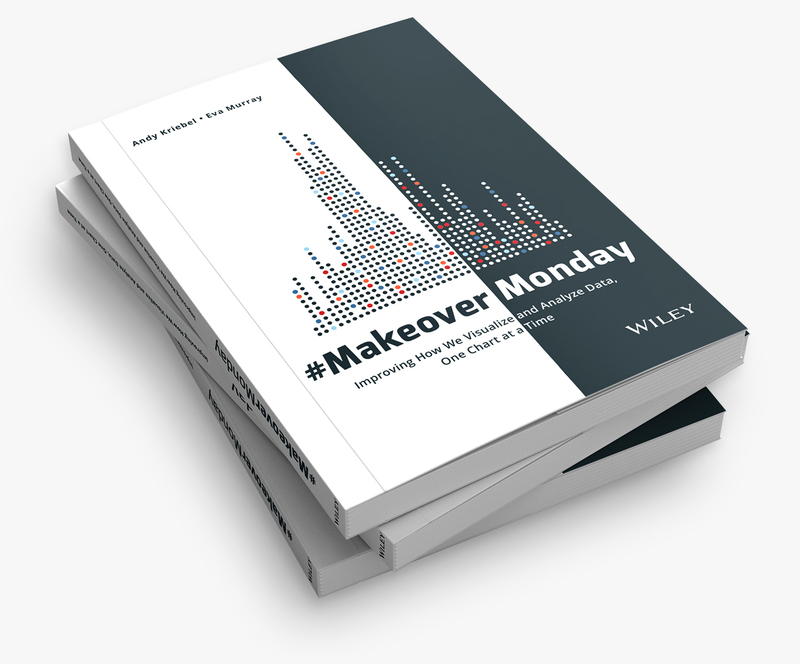 Download the Tableau packaged workbook to come up with insights of your own; it would be great to see what you come up with. There was a warming spike in the mid-1800s. This is quite evident in the line chart below. There are no drastic changes since the 1860s except that the month of July appears to be getting gradually warmer. In this line chart, you can clearly see the spike in the mid-1800s. 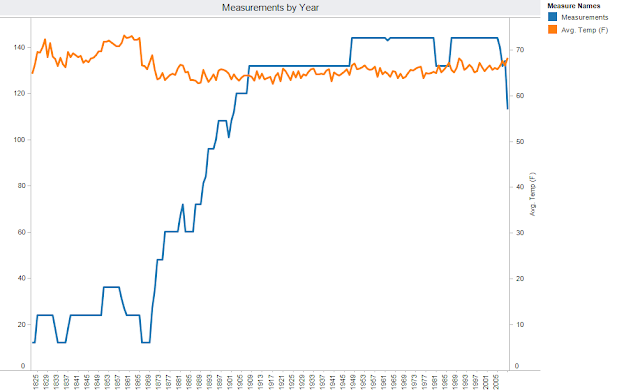 I'm almost inclined to discard data before 1860, but I would need to confirm the inaccuracy of the data beforehand. Also in this chart, you can see that there is an ever so gradual increase in temperature beginning in 1860, with a particular increase since about 1970. I also have a hunch that the data could be skewed because more and more weather stations have been added over the years. This map of the US doesn't reveal much at all. 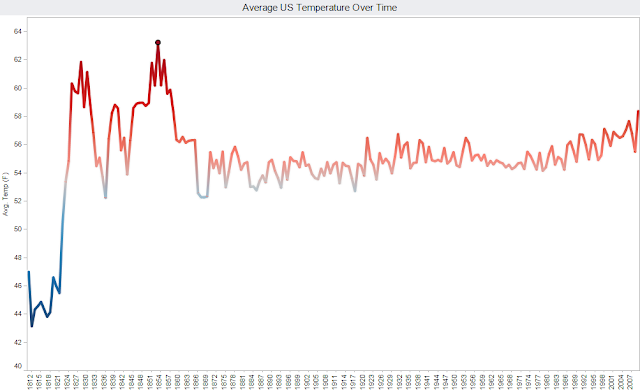 It is interesting, however, to watch the temperatures change over time if you scroll through the years using Tableau. As you scroll through the years, you can also see when weather stations were added in each state. Next, I was just curious to see how temperatures have changed in places where I have lived. Note also that only Florida and South Carolina have had weather stations since data was first collected. South Carolina is definitely getting colder. I wonder why that is. I just had to look into my theory that the increases could be due to an increase in the number of weather stations and thus the number of measurements taken. From the visualization below, you can clearly see that's not the case. In the end, the data does lean us towards supporting the scientists and their "evidence" of global warming. Take it with a grain of salt though since the University of East Anglia's Climatic Research Unit attempted to block access to its emails and data. 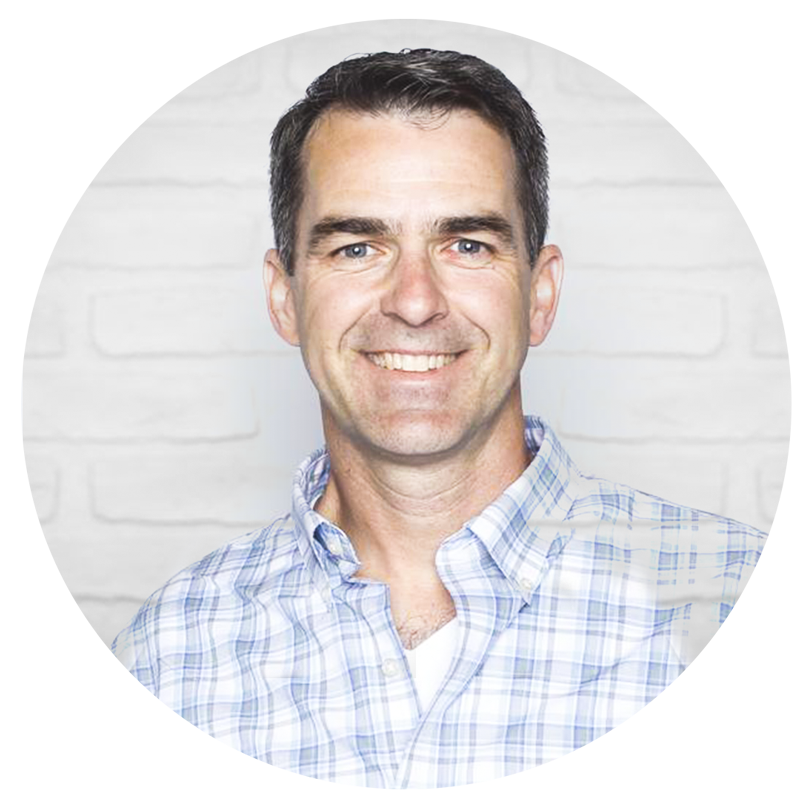 One disclaimer: I am NOT an employee of Tableau, merely a huge fan that loves the flexibility and intuitiveness. Nice analysis Andy. I downloaded your workbook and added (2) worksheets and another dashboard. I'll upload that to your google group page for others work work with. I uploaded a slightly different version of Andy's analysis to his Google Group. 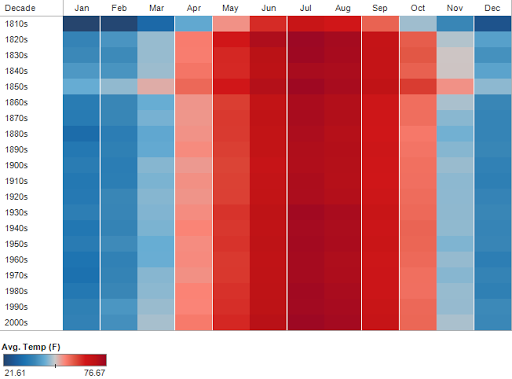 For those of you with Tableau 5.1 Beta 2 access, you can play with my version. If you don't have that I uploaded two pdf's which show the new views. Interestingly you will find very high temperatures and large annual temperature fluctuations during the 1820's. I speculate that a large volcanic eruption may have contributed this. Perhaps that event lead to global temperature instability over the following decade. Thanks for sharing Dan! Nice work!